April tends to be the first foray into a more summer-like pattern and feel across much of the US. Temperatures can climb into the 90s as far north as New York City and Kansas City, humidity and pollen begin to fill the air, thunderstorms – some severe – begin their fast ramp up into early summer’s height, and we start to quickly trim the spread and coverage of cold air and snowy conditions. But that is what’s expected. What about the exceptions to the rule? Where was it downright hot? 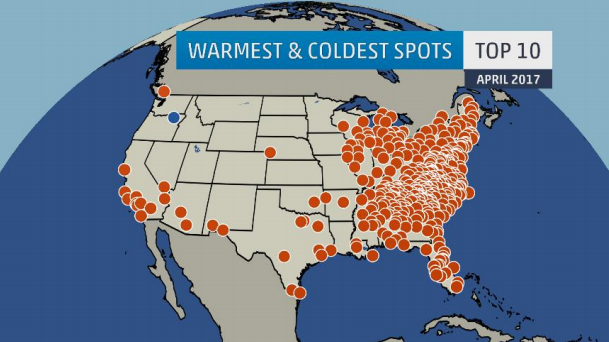 Where did winter hold on for just a little too long? Where did severe weather beat expectations? Let’s see how April fared in this month’s extreme weather recap. Impressive April warmth baked the eastern third of the nation giving way to one of the warmest Aprils on record for the region. In the center of the heat was the town of Brookneal, VA. The town, which is about an hour south of Lynchburg, experienced its 3rd warmest April to date. With an average daily high temperature of 66 degrees in April, 2017’s version bested that 24 times in the month. Fourteen of those days were above 80 degrees; that’s good enough for 2nd highest of any April on record. Twenty-six days ended up above average including a mid-month stretch of 14 straight. But it wasn’t just warm during the day. 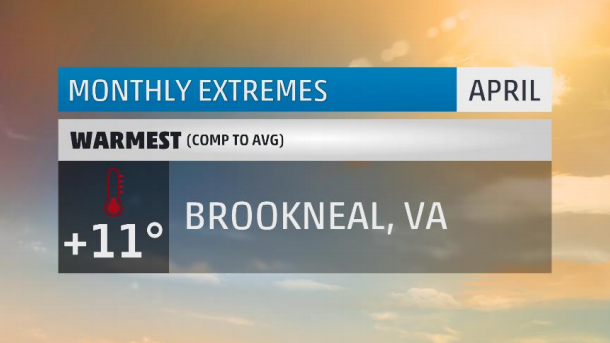 Brookneal set an April record for total number of morning lows at or above 50 degrees at 16. Despite the heat, just two record highs were set and two record warm lows. It was a similar story elsewhere in the eastern US. 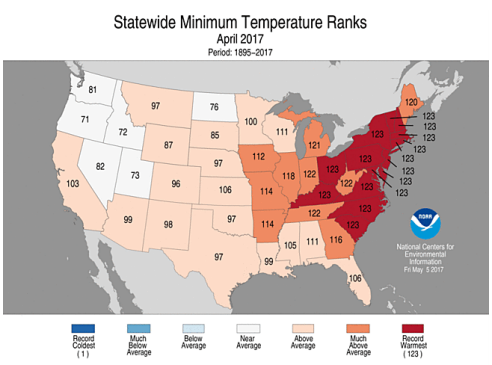 Twenty-four states were well above average including fifteen that saw their warmest April on record. Ninety degree temperatures reached as far north as Atlantic City where they typically wait until June to see their first. Of the nearly 900 weather observing stations in the US, close to half recorded a top ten warmest April! If that’s not enough, of the almost 500 stations to report a top 10 warmest April, over 170 had their warmest April on record. However, even given the dramatic warmth experienced, the nationwide ranking for April was just 11th warmest. More like “coldest”. There was not a lot of cold air to write home about in the month of April. In fact, the Pacific Northwest and Intermountain West were the only locations to record any sliver of below average temperatures. 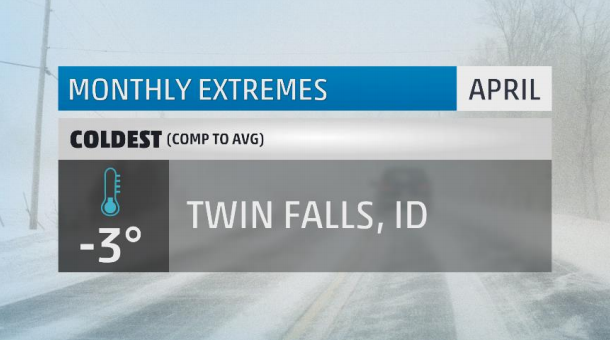 The coldest spot for the month was Twin Falls, ID. Nestled in Idaho’s Magic Valley region, Twin Falls is the one of the state’s largest metropolitan regions. This April was the city’s 4th coldest on record. Twenty-two of the month’s 30 days were below average, but none more than 10 degrees. A roller coaster month of temperatures kept Twin Falls rather temperate. Bouts of warmth were able to drive temperatures up into the 70s while cold shots plunged the populace back into the 20s. 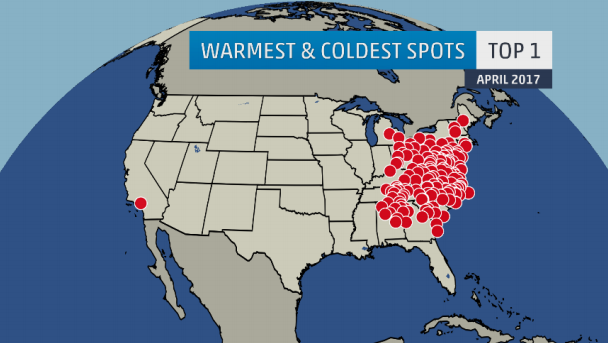 In all, two record lows, two record cold highs, and one record warm low temperature were set. 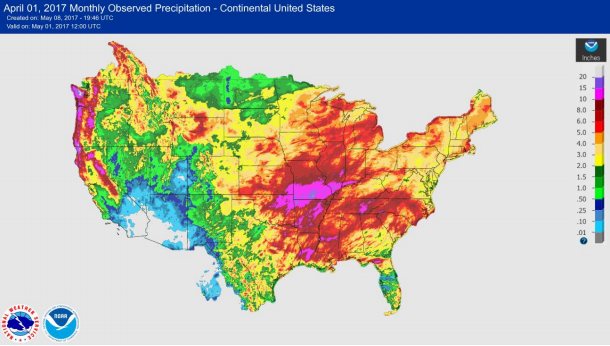 April 2017 was perhaps most notable for the onslaught of heavy rain across the Mississippi River valley. Rains there caused weeks of flooding, pushing streams, creeks, and rivers over their banks, and forcing many to abandon their homes to seek shelter on drier ground. The bullseye of heaviest rain fell across parts of Missouri which is right where our wettest city of the month is found. Pomona, MO is located about three hours southwest of St. Louis and is close to the Arkansas border. The nearly 18 inches of rain that fell made for not only the wettest April on record, but also the wettest calendar month on record. Records were also set for total two and three day rainfall. Close to seven inches of rain fell on the 29th, breaking the record for highest one day precipitation total. 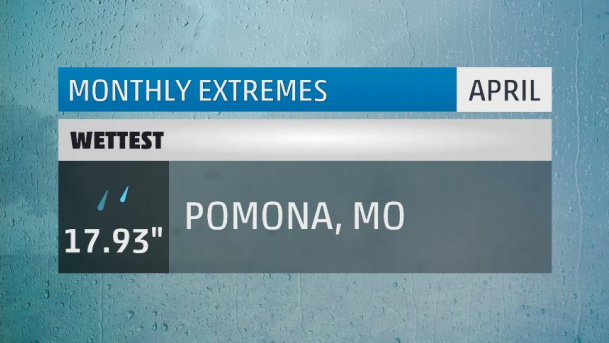 For the month, Pomona was a whopping 13 inches above average. The rain caused parts of U.S. highway 63 to be closed for days while over 70 high water rescues had to be performed across the county. A swath of over 10” of monthly rainfall stretched from Tulsa, Oklahoma to Evansville, Indiana. This caused record river flooding all along the Mississippi basin and its many tributaries. 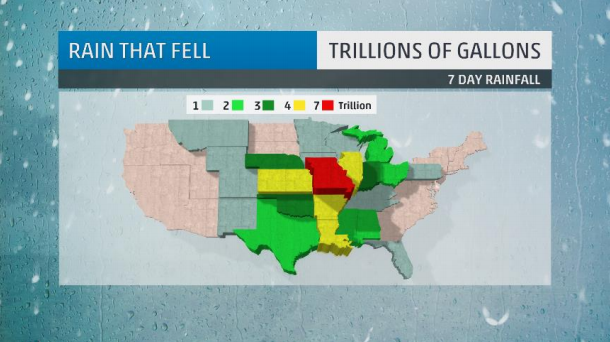 As much as 7 trillion gallons of water fell over the state of Missouri! That’s enough water to fill 10.6 million Olympic sized swimming pools. 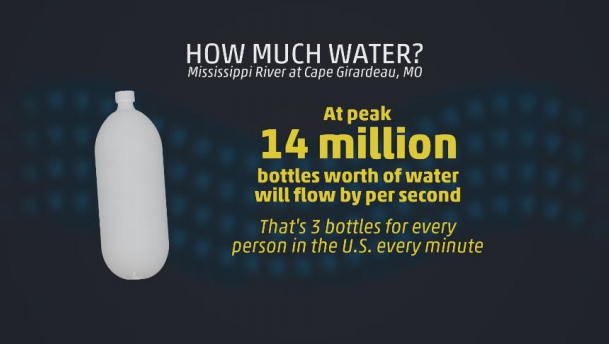 At one point, the flow of water down the Mississippi River was so intense and plentiful that it would provide every man, woman, and child in the US three 2-liter bottles of water every minute! Elsewhere, April brought round after round of severe storms through what is commonly referred to as Dixie Alley. Georgia led the way with 84 reported tornadoes. 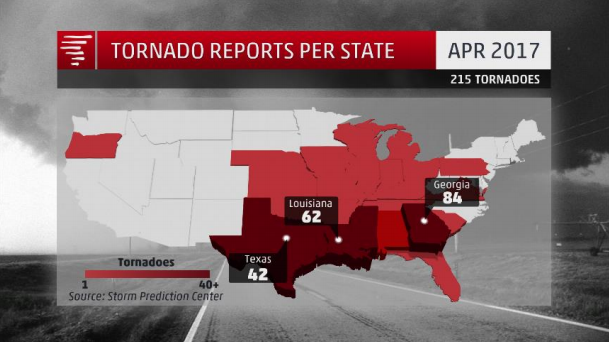 April’s 215 total tornadoes were well above the monthly average of 146. Other than heavy snow falling at ski resorts and high elevation peaks in the West, of the grand network of weather reporting stations, only a handful actually measured snowfall during April. 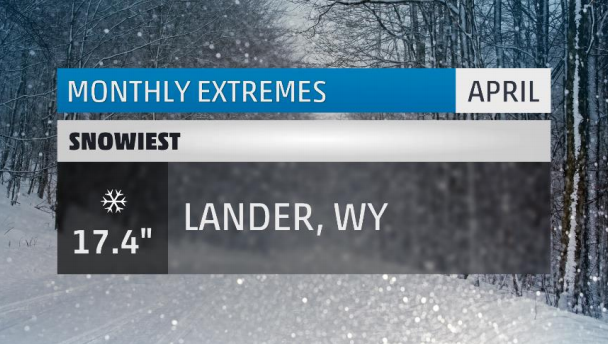 The greatest of these was Lander, WY, where over 17 inches of snow fell. Lander’s snow came in two bouts. The first was from an unnamed winter storm at the start of the month which brought just a little over ten inches of snow to the area. The second round of snow came from Winter Storm Ursa at the tail end of the month. Ursa dropped around a half foot of snow in Lander. This all accounted for Lander’s 53rd snowiest April – a statistically moot value. The city was just about an inch above their typical April totals. Two named winter storms struck during the month of April. The first, an April fool’s day storm named Theseus which hammered parts of interior New England with ice and snow. The second, Ursa, left a path of moderate snow from the Rockies up into the western Great Lakes. Much like last month, the sunniest spot in the US is exactly where we expect it to be – the desert. Barstow, CA finds itself within the Mojave Desert which spans three states in the southwest. During April, Barstow had 30 straight days of bright, blue, sunny skies. Just two days had recorded cloud cover, but each was below 10% total sky coverage for the day. As a result, Barstow saw not a drop of rain during April. 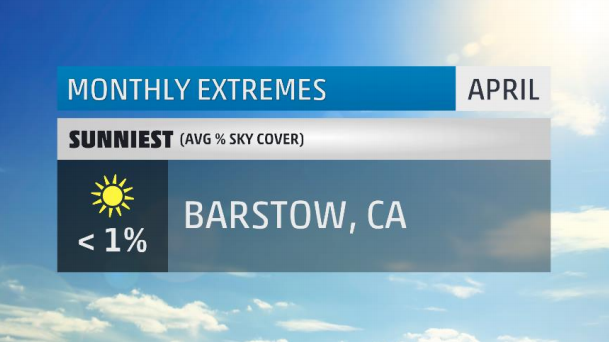 On average, Barstow sees about 24% average sky cover during the month of April. Its sunniest month is typically September. In all, the city will usually see close to 280 sunny days per year. It was a different story on the other coast. Bangor, ME was stuck in the clouds during the month of April. Of April’s 30 days: 10 were completely overcast, 17 were mostly cloudy at best, and 3 managed to be mainly sunny. Fourteen of those cloudy days were accompanied by measurable precip (both rain and snow) and only eight days of the month were totally dry. 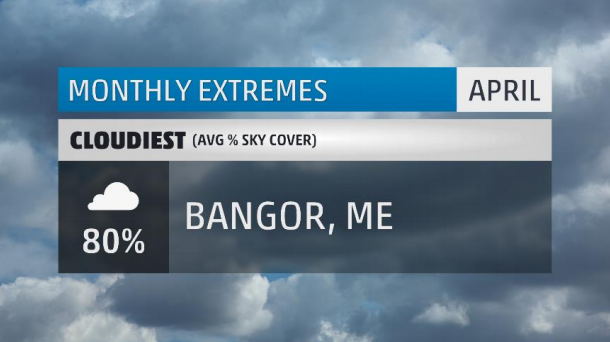 Bangor averages 177 sunny days per year. This comes as no surprise as Maine is the second least sunny state in the US (Vermont is #1). July is generally their sunniest time of the year; the rest of the months are anyone’s guess. There you have it, the extremes for the month that was April 2017. Make sure to check back next month to see what May has in store. What weather extremes did you face in April? Let me know in the comments below.